Are you looking for simple tool that can bookmark and put the shortcut links of your favorite websites in homepage screen so that you don’t have to spend time browsing them even from the favorite folders? You may have tenths or hundreds of favorite websites being bookmarked but only few of them are accessed frequently. In this scenario, Only2Clicks may be the best option for you. As the name implies, it simplifies the favorite websites access by consolidating all the websites’ links into a single page, thus promoting great user experience and efficient web searching. It even does more by having way to save the websites’ view as clickable thumbnail icon for faster access. In order to enjoy these benefits, just go to register a new account for free at Only2clicks. Once registered, you can start dragging and adding all your favorite websites by providing the correct URL (Uniform Resource Locator) into the required fields. Besides, there is an option to add all famous search engines such as Yahoo, Google at the same page so that you can just do a quick search without the need to access them one by one. To make it a more complete GUI (Graphical User Interface), users have option to snapshot the websites’ view and display it as part of the clickable icons. This will make it more user friendly especially for those old folks that can’t live without web surfing. Also, all these can be organized based on specific category that it belongs to for easy retrieval. 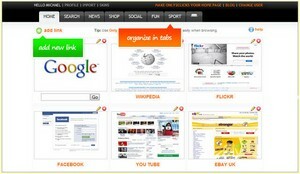 Besides targeting for PC users, the web service is also specially designed to be used on famous Apple’s iPhone and iPod. So, if you are currently an iPhone user or looking for a second generation iPhone with 3G download speed next month, just register one at Only2clicks today ready for web browsing at high speed.